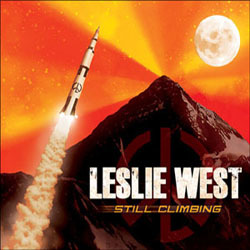 Leslie West, the legendary guitarist, vocalist and original founding member of MOUNTAIN, will release a new studio album Still Climbing on October 28th via Provogue Records / Mascot Label Group. Since his historic performance with MOUNTAIN at the 1969 Woodstock Festival, West has enjoyed a glittering career spanning over half a century, accomplished in spite of a life threatening battle with diabetes, which cost him his right leg in 2011 (shortly before the release of his Unusual Suspects album). "I’m lucky it wasn’t one of my hands or I’d be screwed," says West. "It was a difficult struggle, and after the amputation I didn’t know whether I’d ever want to or be able to perform again. A month later I played at the Rock ‘n’ Roll Fantasy Camp in New York City, and I heard my guitar on stage and that was it. I knew I had to keep going." Looked upon by West as a sequel to Unusual Suspects, which featured collaborations with the likes of Slash, Zakk Wylde, Steve Lukather, Joe Bonamassa and Billy Gibbons, Still Climbing sees West joining forces with Jonny Lang, Johnny Winter, TWISTED SISTER’s Dee Snider and ALTER BRIDGE and CREED’s Mark Tremonti. "Not Over You At All"